There's nothing that's more likely to cause a Western anime fan sheer excitement in Japan than seeing a familiar product with anime branding. It feels like an anime Utopia is one step closer as you cradle your Gundam Pepsi, it links your world to the world of anime and makes you think what the future may hold. So the opportunity to buy Evangelion Doritos is one that cannot be missed. Probably everyone reading this review will have tried Doritos. They're tortillas for the masses, and many a person's hunger on a drinking session has been sated by their slightly stale saltiness. There are several flavours of Doritos, and I always find a certain sense of disappointment when I eat them. They never taste as good as I remember them, and I always wonder why I didn't buy the Kettle Chips instead. 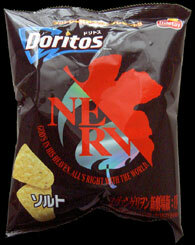 But these are Evangelion Doritos, so surely they'll be better than normal! They may be LCL flavour!! Ok, so my mind was running away with me, I don't really want Angel blood flavour crisps. But there has to something special about these surely? Well not really. Signs are good at first though. You open the packet to find that they're not the triangular shape you are accustomed to, instead they're slightly smaller and in a shape that's oddly reminiscent of a tongue. Interesting? Well not really. But come on, it's a packet of crisps and you have to find something to talk about other than the most important thing - the taste. I was not quite sure what these would taste like. Eating in Japan can be a bit of a minefield, I have narrowly avoided chicken cartilage kebabs and prawn burgers in the past for example. So I was understandably a little wary before tasting these...but I shouldn't have been. The Evangelion Doritos were just plain, salted Doritos. Not Cool Original flavour, but the ones you can buy for eating with dips. Once again I was a little disappointed by Doritos. They were fine, but without a dip they were a bit pointless, and I didn't see any corresponding Evangelion dips for sale. Maybe the slight salty flavour came from the tears of an Eva pilot, I consoled myself with that thought as I munched my way through the packet. 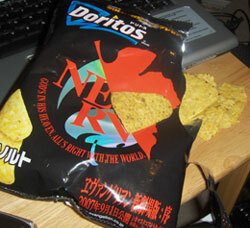 So disappointing, but if you're going to buy Doritos you may as well get Evangelion ones. The series is thought provoking and superb, if slightly confusing. The crisps are none of these things, but they taste ok and the smugness factor if you eat them in from of other anime fans is immense, so they're worth a go. The come in packets with several different Evangelion designs on them, ranging from the Nerv logo on the packet I bought to pictures of the characters and Evangelions themselves. Not bad, but not that inspiring.